The HTML is the script -- the lines the actors and actresses say as the play progresses. It’s “In Fair Verona, where we lay our scene”, it’s “What's in a name? that which we call a rose / By any other name would smell as sweet”. The CSS is the costume and set design -- how everyone looks, and how the set looks. It’s the poofy shoulders, the cobblestone street, the oil lamps. Two people can take the same content and style it very differently. 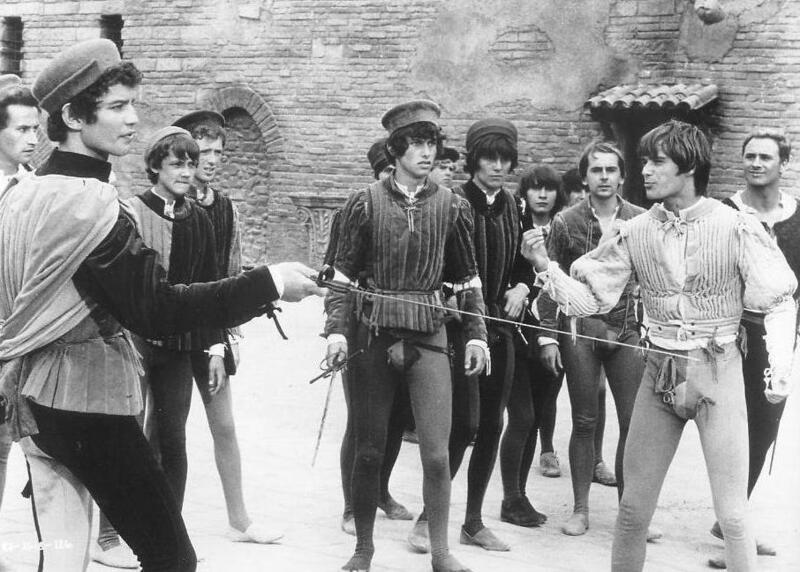 In terms of Romeo and Juliet, you have the classic 1968 version, with swords, tunics and cobblestone streets. And you have the 1996 version with Leonardo di Caprio, guns and suits. The two movies have the exact same lines, but they look and feel very different. That’s what CSS can do to HTML. 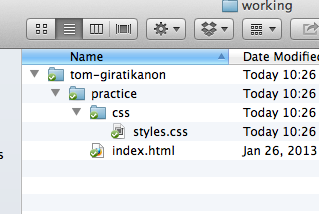 In the "practice" folder, make a folder named "css"
Create a new file in that folder named styles.css. It's okay if it's empty. Next, let's tell the HTML where this file is. Under the title tag, we can put in a link tag. 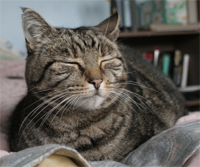 -- You'll notice the link tag doesn't have a closing tag. Tags like this are called "empty elements"; they will never contain anything, they only have attributes. Looking at what it says: "rel" stands for relation, and "href" stands for hypertext reference (remember how HTML stands for Hyper Text Markup Language? Yeah, you'll never have to think about that fact again.) So this essentially says, the reference I'm about to give you is a stylesheet, and here it is, at css/styles.css. Okay, let's look at some CSS. So what does this do? Can anyone guess? Right, it changed the h1 tag to red. So let's look at that CSS rule up close. 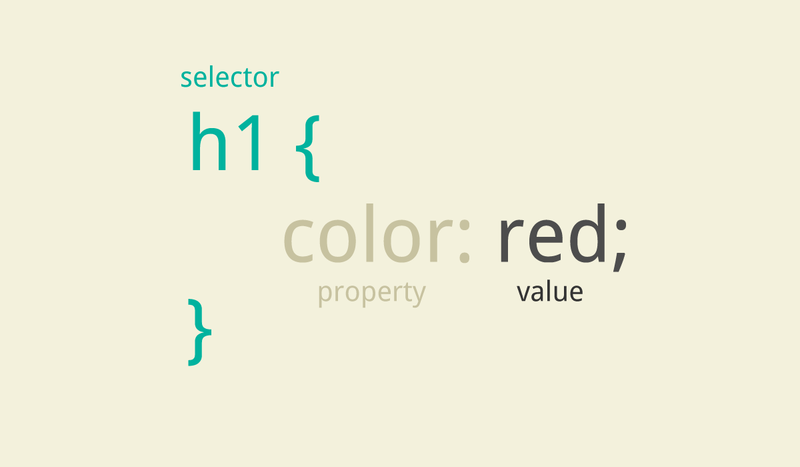 A selector, this is where you pick which tags to affect. Here, I've picked every h1. A property, this is where you pick what aspect of the tag to change. I want to change its color. And a value, which is what we set the property to. I picked red, 'cause you know, lobsters. So now you know what these mean, here's another way to think about it. And it's how I think about it when I'm coding. What is the element called? What's the property I need to use? What's the value I want? But it doesn't have to stop with one property. So this says, all H1s should be the color red and use the font ‘Comic Sans MS’. What if we want to change how the paragraphs look? We can add another rule. So you're starting to get the hang of reading CSS. Before we let you write your own, we wanted to show you one more thing. Colors. What if I don't want it to be generic red? How do I tell the Internet what color I want it to be? With numbers, or more specifically, hex codes. 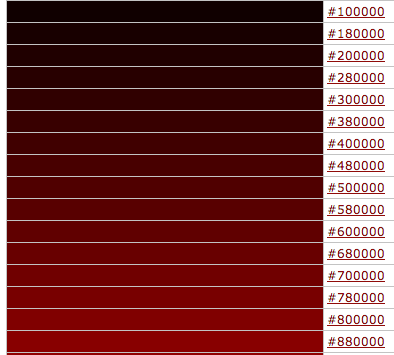 These aren't even all the options for red. But if you ever are stuck, there are great tools out there for picking colors, let's google it together. Don't know how to write a CSS property? Google it! So that’s the gist of it. We’ll let your mentors help you get some CSS on your page, and they’ll show you some more properties. When you’re feeling comfortable with that, we have an exercise for you to style your HTML page in a certain way.